The Yogi Bhajan, a Sikh, always wore white. Although he died in 2004, there is still controversy surrounding Yogi Bhajan: criticism that analyzes his attitude toward women, his Sikh faith, and his real influence on the followers of his beliefs. Yogi Bhajan was born in 1929 as Harbhajan Singh Puri in the Indian province of Punjab. His grandfather served as Bhajan's spiritual guide. Bhajan earned a master's degree in economics, and worked for the Indian government as a customs official for more than a decade. Bhajan studied Kundalini Yoga at a very young age, and his teacher declared him a master of the practice when he was just 16. Even as an adult raising a family and traveling across India to fulfill his civil service duties, Bhajan continued his intense yogic studies. He eventually left his government position to become an instructor at a Kundalini ashram. When forced to choose between joining a research program at his government's bidding or leaving the country, Bhajan decided to immigrate to Canada in the late 1960s. He started some yoga programs there, then left for Los Angeles, California to work with a friend. This is when his popularity as a yoga instructor and spiritual leader increased. Bhajan created the 3HO Foundation in 1969. The basic tenets were every person deserved to be healthy, happy, and holy, hence "3HO". As the counter-culture movement reached a feverish pitch in the U.S., many turned to yoga, meditation, and other methods to expand awareness. It was around this time that Bhajan became known as a yogi, as well as Siri Singh Sahib. He also assumed the legal name of Harbhajan Singh Khalsa Yogiji in 1976. 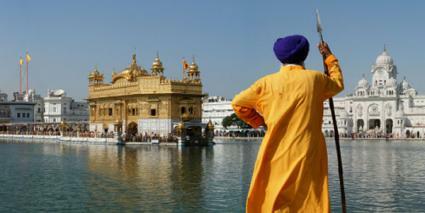 Bhajan set out to expand the Sikh presence in the U.S., and the 3HO Foundation was the launch pad for this effort. He also positioned himself as a predominate leader Tantra Yoga, and many of his methods were implemented in the 3HO ashram setting. Followers and students could stay for a day or forever. Within three years of the organization's founding, 3HO ashrams were in more than 100 locations. Today, the center operates all over the world, providing guidance in physical and spiritual health, prosperity, healing, and the ways of Sikh Dharma. Through 3HO, the Yogi also developed a number of successful businesses, including a high-end security company, Yogi herbal teas, Golden Temple natural foods company, Peace cereals, and Soothing Touch health and beauty products. When discussing Yogi Bhajan, criticism of his methods, attitude, and illusions of grandeur are hard to ignore. Similar to rumors surrounding Maharishi Mahesh Yogi, the founder of Transcendental Meditation, there are reports and lawsuits stating Bhajan manipulated individuals into buying items, property, and healing techniques. Although an ardent follower of Sikhism, many in the faith consider his spiritual methods and teachings in direct conflict with the core principles of the belief, and branded him a heretic. There are other reports that allude to the Yogi's relationship with women as mentally and sexually abusive, and that his womanizing caused a number of problems within the 3HO organization. Former followers have accused him of employing mind-control techniques and cruel judgment. The Yogi was criticized for considering himself as influential as Jesus Christ and Buddha. Others praise the Yogi for advances he made in Western culture to promote faith and the practice of Kundalini. He is credited with being one of the first instructors to teach Kundalini publicly, and spur an interest in the practice. He also founded the Kundalini Research Institute and the International Kundalini Yoga Teachers Association. The American Hopi Indians viewed the Yogi as a mystic savior, and each year their land is the location for his International Peace Prayer Day. While his methods of practicing Sikhism are disputed, many Sikhs admit the Yogi encouraged more knowledge about and less ignorance of the faith.